St. John was killed because he reprimanded Herod and Herodias for their unlawful union, and because Herod was pleased at the dancing of Herodias’ daughter Salome. 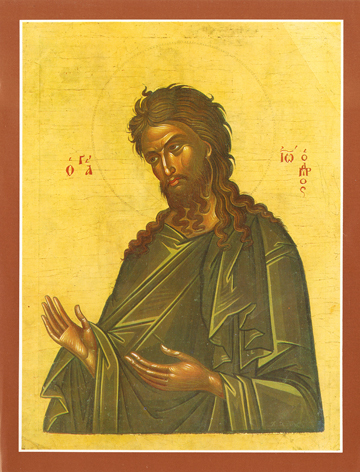 St. John bows his head humbly, and raises his hands in supplication to Christ. He was a fiery and blazing torch of faith and repentance, calling many in Israel to the baptism of repentance before Christ would give the baptism of spirit later. He is an icon of faith, of faithfulness, of repentance, and of love, and by Christ’s own words, “The greatest among those born of woman.” He stands now at Christ’s left hand in His Kingdom that can know no end. Holy St. John pray for us!